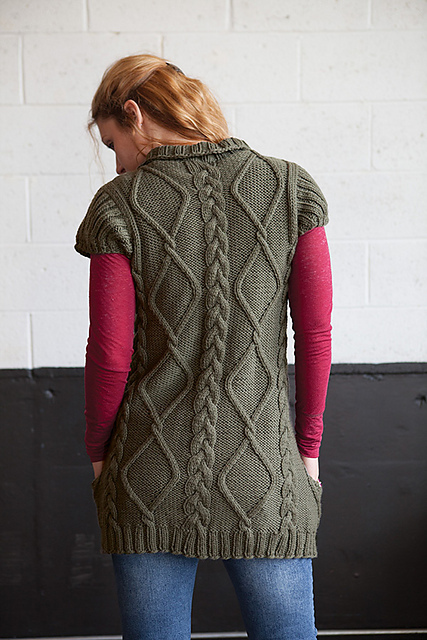 Last week, Knit Picks released their Fall 2013 collection, Reclaimed, a set of 15 patterns centered around the idea of "classic and simple structures reimagined with unexpected elements." As with their Spring collection from earlier this year, this is a thoughtfully and beautifully curated collection with lovely photography and styling, and some really gorgeous designs. And, again, I'm thrilled to have a design included! Atmos is a long cardigan worked from the bottom up with lush cables running up the fronts and back. The little puffed sleeves are picked up from the armhole opening and shaped with short rows, and pockets are added as you go. It's a very cozy piece that is incredibly simple to work up. 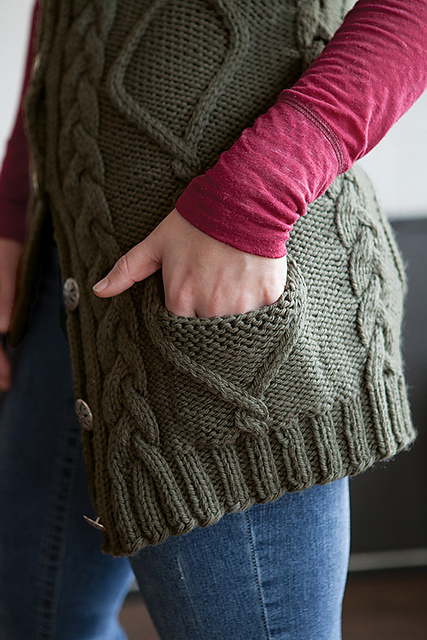 There is minimal shaping, so you don't have to worry much about interfering with those cables, and it knits up quickly in bulky yarn. Ahhh, so young and free in those pre-baby days! But when I went to write the pattern, I couldn't figure out how to chart the cables and I got really hung up when I got to the short row shaping in the sleeves. So, my pattern notes were set aside, the Cloudy Sunday name was repurposed the following year, I wore the sample practically to pieces, and the design remained a little cloud hanging over my head. I hate unfinished business. Finally, when the Reclaimed call for submissions came out, I immediately thought of this sweater. It's a simple shape with a simple cabled theme, but the puff sleeves, pockets, and high collar give it a modern twist. I nervously dug out my notes.....and with four years of design experience under my belt, I realized that writing the pattern was going to be a piece of cake. What was I worried about for all of those years?! Anyway, I am excited to say that the renamed Atmos (Greek for steam) Cardigan is out there now for public consumption, and I hope you like it. 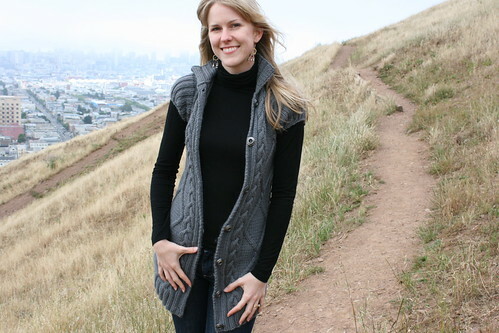 I have loved wearing this sweater, and come fall-time I'll show you a way to modify it into a fun vest. Sizes: 32.25 (36, 39.75, 44, 47.75, 52.5, 55.75, 60, 64.25)” finished bust measurement; garment is meant to be worn with 0-2” of negative ease. Yarn: Knit Picks Wool of the Andes Bulky (100% Wool; 137 yards/100g): Wallaby 25775, 6 (7, 8, 9, 9, 10, 11, 12, 12) skeins. You can find out more information on Ravelry here and also view the whole collection here . And you can pick up a copy of the collection (either in ebook or real book form) or individual patterns on the Knit Picks site here. I am smitten! I have to grab my knit picks catalog right now and queue the pattern. love it, look so cozy! Oh, that's really cute! Love all the cables and the long length. It's beautiful and stylish ~ just like you!!! I feel as if I have watched you "grow up" from your first few pattern forays into the accomplished designer you are today. 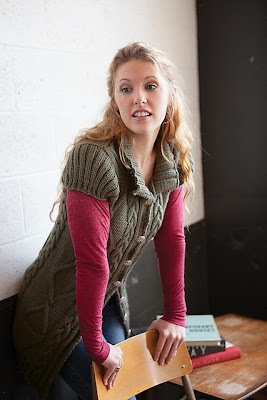 I love this cozy and wearable design and I know it will be worn and enjoyed by many hand knitters!